What is it about fall weather that makes you want to pick apples, eat pumpkin flavored treats, play in leaves and dress up like a ridiculous character? I have no explanation for it but I am definitely prone to fall-themed emotional attachments. 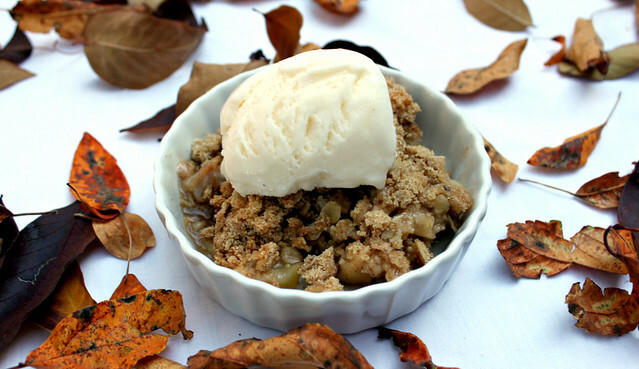 This apple crisp is perfect for those “crisp” fall days when you are craving a cozy dessert. Of course it is best served warm with a scoop of vanilla ice cream or frozen yogurt. The Perfect Pairing for this apple crisp is golden delicious or yellow delicious apples. These apples are not the best for snacking but they are great in desserts. You can make this with other varieties of apples but I think these are the best varieties for apple desserts. I act like I know what I am talking about…. But I have learned this from my grandma and mom who have made a ridiculous number of apple pies and apple crisps. This advice comes straight from the gurus of apple dessert. They know what they are talking about! Preheat the oven to 350 degrees F. In a large bowl combined the diced apples and next six ingredients (through nutmeg). Stir until apples are evenly coated. Pour apple mixture into a greased 11x7 or 9x9 dish. In the same bowl combine the oats, flour and remaining ingredients. Stir until combined. Pour the oat mixture over the apples and press down lightly. Bake for 30 to 40 minutes until apples are bubbly and the top is golden. Looks amazing, this is definitely going on my I-need-to-make-this list!